Word Macros are a way to automate the repeated tasks to be performed on a Word document. Many consider a Word Macro to be too geeky and creating them is difficult as it needs programming knowledge. However, this is a misconception and this is a simple tutorial on creating Microsoft Word Macros, that will help every Word user. A macro is a way to automate a task that you perform repeatedly or on a regular basis. It is a series of commands and actions that are grouped and stored together and run whenever you need to perform the task. You can record or build a macro, and then play the macro to automatically repeat the series of commands or actions. You may find Word Macros to be very useful in speeding up several daily tasks that your job requires you to perform on Word documents. Macros can be used to automate any complex sequence of tasks to be performed on a Word document. Any routine task including editing and formatting can be easily performed by writing a macro for it. 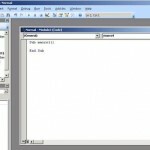 How To Create a Word Macro in Microsoft Office 2007? Word Macros can be created either by using the inbuilt macro recorder or by writing Visual Basic for Applications (VBA) code.Here, we will detail the steps to create a Word macro using the macro recorder, as it is relatively easier to use. The recorder can be used by anyone and it doesn’t require you to possess any knowledge on computer programming. Click the Microsoft Office Button, and then click “Word Options“. In Word Options Window, Click “Popular“. Under “Top options for working with Word“, select the “Show Developer tab” in the Ribbon check box. How to record a Word Macro? On the Developer tab,click “Record Macro“, under the group “Code“. In the text box labeled “Macro name“, type a name for the macro. But you need to be careful in naming a macro. If you give a new macro the same name as a built-in macro in Office Word 2007, the new macro actions will override the built-in macro. To check the list of built-in macros, click the Developer tab and under the Code group, click Macros and choose Word Commands, under “Macros in” drop down list. In the Store macro in box, click the template or document in which you want to store the macro. A template is a file that contain the structure and tools for shaping such elements as the style and page layout of finished files. 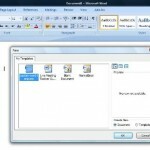 For example, Word Templates can shape the entire Word document. Then to begin recording the macro without assigning it to a button on the Quick Access Toolbar or to a shortcut key, click OK. Perform the actions that you want to include in the macro. How to assign the Word macro to a button on the Quick Access Toolbar? If you want to assign the macro to a button on the Quick Access Toolbar, Click the button and Under Customize Quick Access Toolbar, select the document (or all documents) for which you want to add the macro to the Quick Access Toolbar. It is important to remember that to make your macro available in all documents, you need to click Normal.dotm. How to assign a keyboard shortcut to the Word macro? It is also important to remember that when you record a macro, you can use the mouse to click commands and options, but not to select text. You must use the keyboard to select text. That is all about creating Word Macros.